This year, my son's Family Day is strategically scheduled during the start of the semestral break (October 25). Since it's also a few days before Halloween, the PTA officers thought of making it Halloween-themed instead of the usual s ports-oriented family days that we have had. A few days before that date, the school will also be having its United Nations Day program. My son will be representing his class to the school program. He informed me that he will be singing with a group of other Grade 2 pupils. He was also assigned to wear a national costume of a country of our choice. That's what keeping me busy today. My husband surfed the internet for some costume ideas. One of our considerations in finding the right costume is that it should be something that my son can easily dress himself up before the program. My son's adviser reminded me last Friday that he should come to school in his school uniform and he just needs to dress himself up before the program. 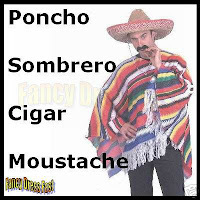 My husband thought that a Mexican costume like the one in the picture below will be a convenient choice. Ralph will be wearing something like this, without the cigar, of course! I thought that this will also be a wise choice at the same time because I can convert the same costume to become a scare crow costume for the Halloween Family Day! A few years ago, when Rap was still in Kinder 1, his class represented the Philippines in the UN Day celebration. I dressed him up as a Katipunero complete with a straw hat and tabak (sword). Laguna Bel Air held an annual Halloween Trick or Treat festival for the kids in the village. For that event I used the same Katipunero costume, stitched up some patches, attached the straw hat in the hat, painted Rap's face like a pumpkin, and made him look like he was tied to a post like a scarecrow. Guess what? He won 2nd place! So there, our costume hunting problems are solved. Now it's time to buy the materials in the mall now.